The last month has been quiet for work because of the rain! I went back to The Regency Town House for a week or so and Nick Tyson, the Curator suggested I do some research into flint and bungaroush walls. I remembered a company based in West Sussex who teach courses at the Weald and Downland Open Air Museum, called Berry-Middleton Ltd. I looked them up and recalled how their website expressed such a genuine enthusiasm for their craft and this time I noticed that they also supply flints, so I decided to get in touch, at the very least hoping to buy some flint to practice knapping with. I also mentioned that I was available for work so was thrilled to receive a call from Mark Middleton inviting me to spend some time on site with his company. 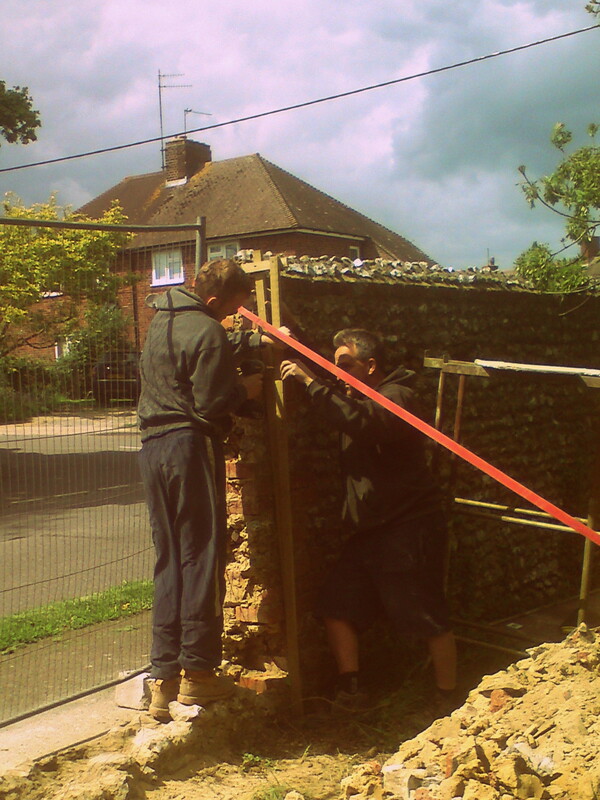 I met the Berry-Middleton team on site in Steyning where they were working to take down and rebuild 4 panels of coursed semi-knapped flint wall. They dismantled the panels by hand, piling up the flints and putting the rubble to one side to back-fill the wall as they rebuilt. 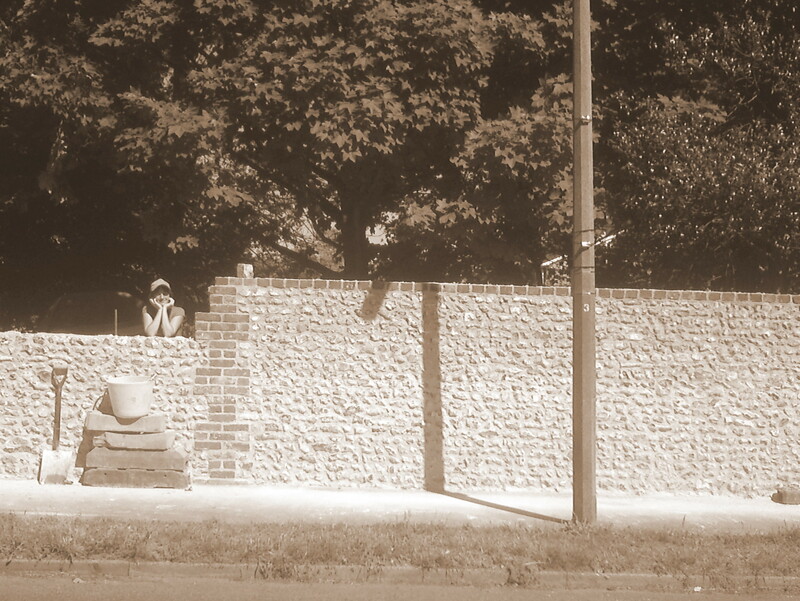 The wall was wider at the bottom than the top and tapered on one side so a profile was made, taken from the brick haslers which divided each panel of wall. The haslers were rebuilt according to this profile and string lines run between them for laying the courses of flint. 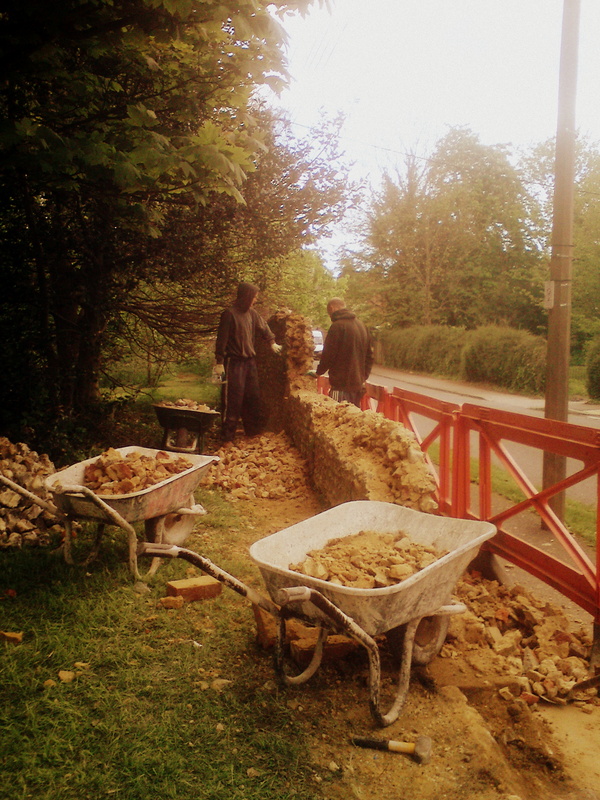 As Mark and Phil laid the courses of flint, David and I kept them supplied with flints and mortar and followed behind to back-fill the wall with rubble and more mortar. A brick course was added to the top of the wall before capping. Mark, Phil and David were very welcoming and didn’t seem to mind answering all my questions whilst we were working! They make a great team, working efficiently and systematically and I really enjoyed the 2 and a half weeks I was able to spend helping them on this project.